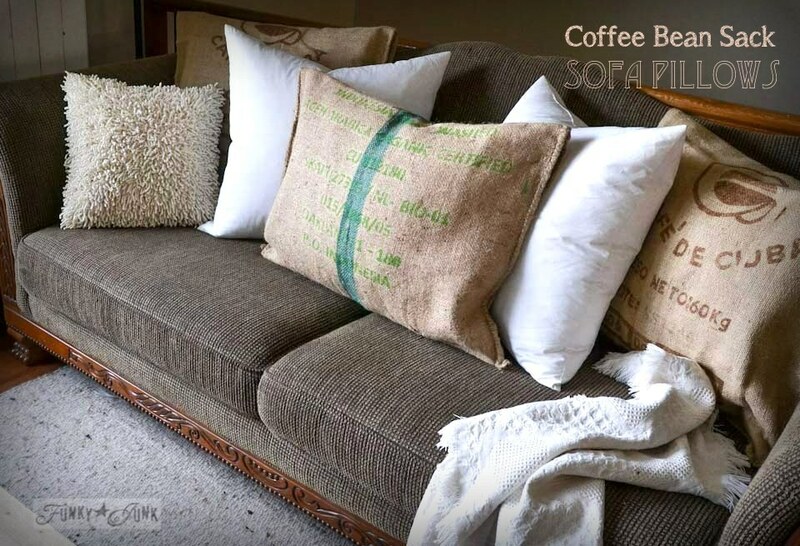 No sew burlap coffee bean sack sofa pillows… instantly! 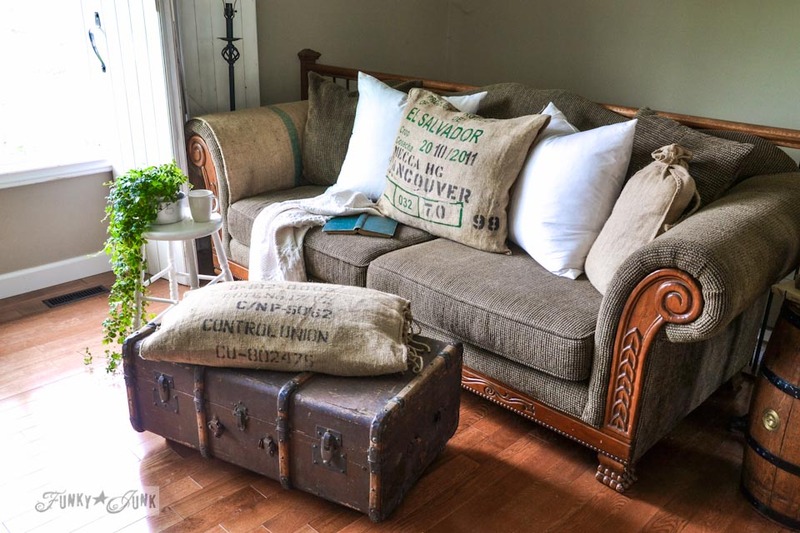 One frequent question I get asked are where I get my burlap sofa pillows from. I’m nearly embarrassed to tell you how ridiculously easy it is to get this instant look with these no sew burlap coffee bean sack sofa pillows. But I will anyway. Non sewers unite! 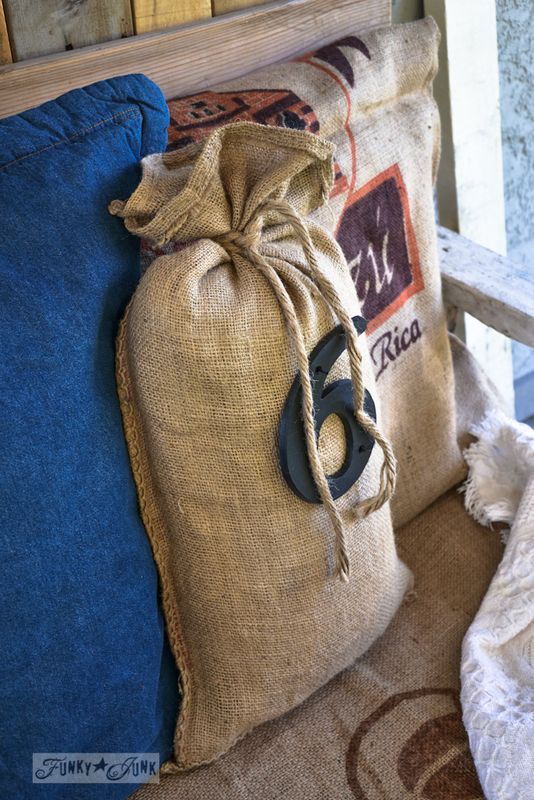 Collecting burlap coffee bean sacks are the key. 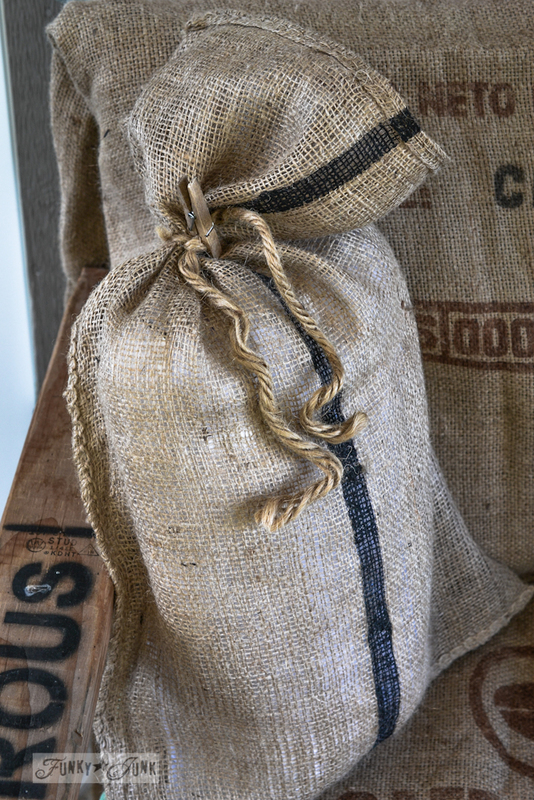 Check with a local coffee roaster in your home town because they are the ones that receive the bags in bulk. I found mine from The Back Porch in Harrison Hot Springs, BC Canada. They are indeed a local coffee roaster kinda place I blogged about a few times. But they don’t always have them in. But when they do, I stock up! I use these things for so many things, such as my faux coffee bean sack window valances HERE. Anyway, here we go with this deeeeep involved tutorial. Ready? 1. Insert pre sewn coffee bean bag over existing premade pillow found at a thrift store. 2. Flop over the top. The pillows are so easy to change out, that I frequently give my sofa a new look. I even made a pillow case for the old trunk ottoman. 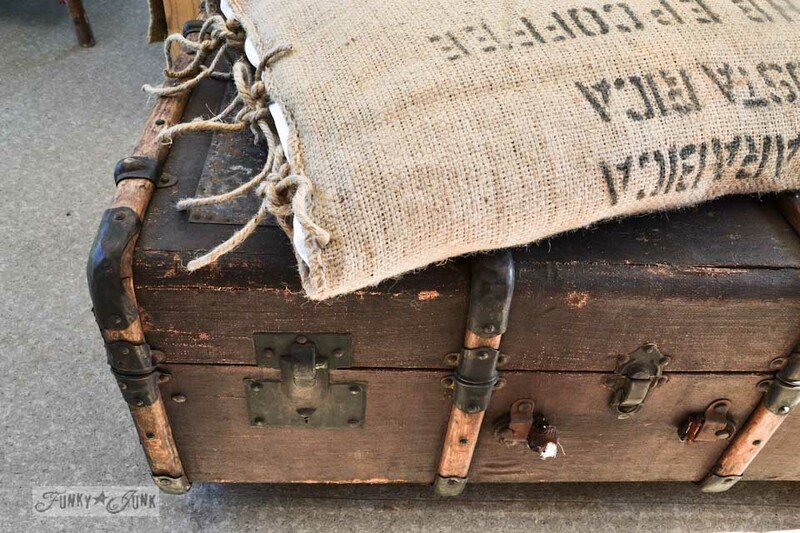 This case was wrapped around a pillow with ties hand sewn onto the ends with heavy twine. and the pallet sofa. Even the bottoms are just loosely wrapped in place. 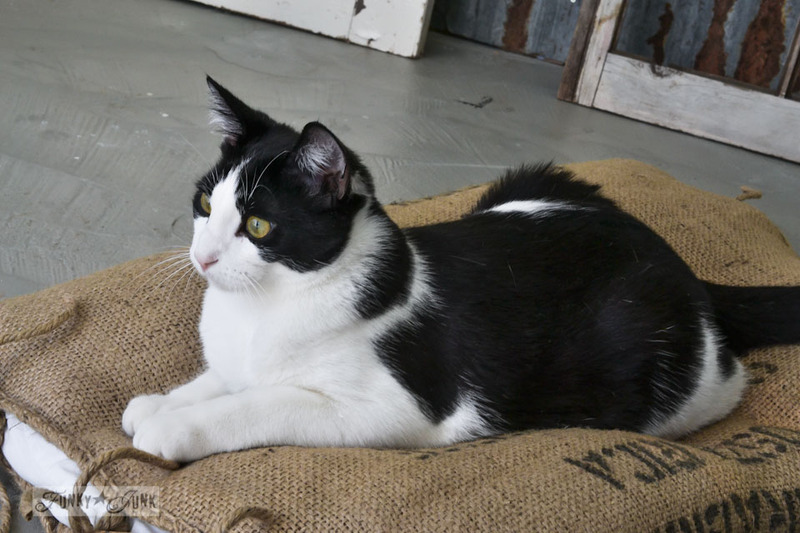 Same deal with a $1.50 sand bag pillow. You may find them at your local hardware store. This one was painted with acrylic craft paint in about 10 minutes. I don’t know. The only time I’ve washed burlap, it came out like an Abraham Lincoln wig. It didn’t work out. So I never have again. I just beat them or wipe them clean. Yup! If it’s shorts weather, I’ll throw a sheet on the outdoor pallet sofas first before sitting down. But we only get 1 month of summer in BC Canada anyway. Seriously, if I could find my silly lost sewing machine pedal, I’d probably do more permanent types of cases. As it stands, it’s gone, so my ancient machine that never worked very well sits and continues to turns yellow with time. One day I may spring for a new machine. Any recommendations? … us non sewers are ALL quite happy just the way it is! Quick and easy, for sure…and they look super cute with your darling kitties. Donna, THAT is a skill level I can relate to. Ha! I totally love the look of these, too. My “brown-sectional-that-I-hate-but-can’t-afford-to-replace” could really benefit from a new pillow look like this. Thanks for the awesome tutorial (giggle). Never get tired of seeing those cute kitties either! Your ideas are inspirational and so easy to create. I’m sittin’ here speechless. 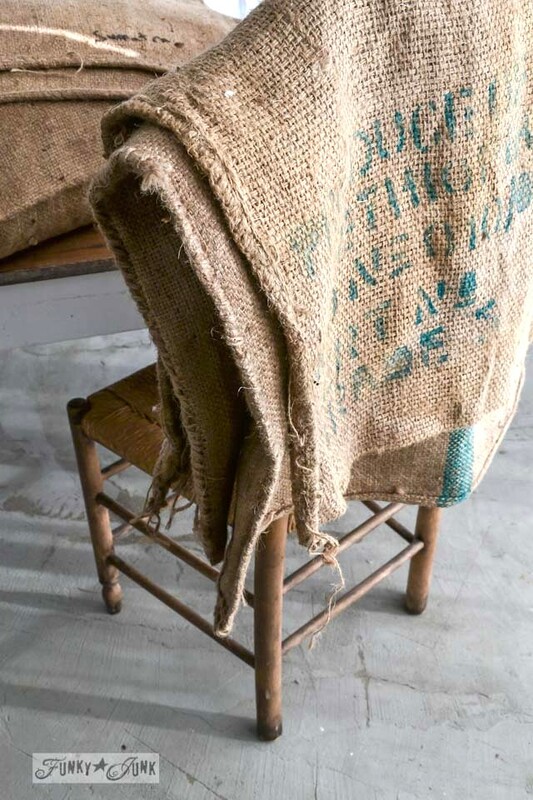 Like you, I LOVE this look but never had a clue where to find the burlap bags (except at an antique shop for megabucks). So, that bit of info was priceless! Thanks again, Donna, for another great idea! Luv the idea, I sew but not for too long now, anyway I was thinking of the Back Porch coffee place, and here you mention them ! I live only 15 mins. from them. So I will go see now if I might find some. It is a really cool place, a must see if in the area 🙂 Great Article..luv your site too ! Fantastic craft at the perfect time!!! I just got 12 coffee sacks at $1.50 each at a fantastic reuse shop called Second Use down here in Seattle. Living in the country’s Coffee Capitol is finally paying off! Anywho, I would love to know how you sewed your heavy twine in. Some sort of fat needle? 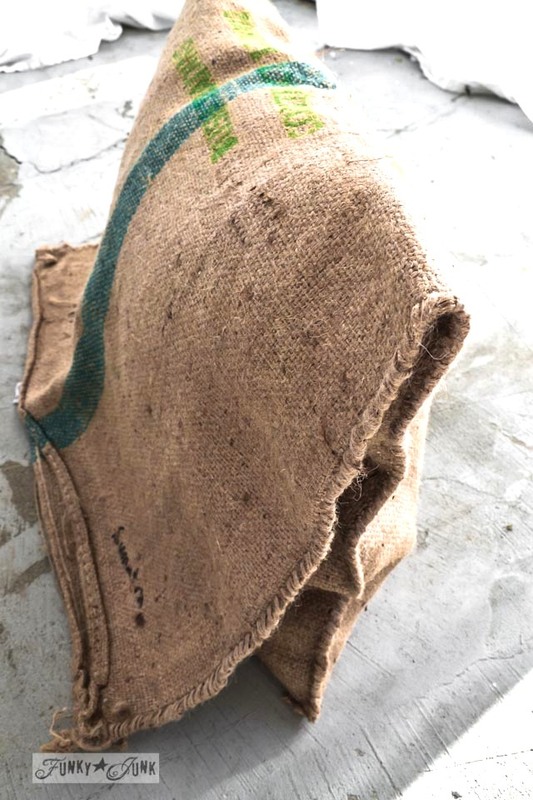 I’m hoping to connect my “pillow” sacks and make them the bottom cushion for a large parpasan chair I found in the dumpster…. perhaps throw a thin dog bed pad on top? We’ll see. Thanks for any advice. Thank you for posting such interesting and realistic projects. It makes me feel a relieved to know that I’m not the only non-sewing machine-hand sewing crafter out there. You’re a hoot! I’m a card-carrying non-sewer, too, and I wholly subscribe to your methods! I absolutely love this! Now all I need to do is find some grain sacks! Non sewers unite! 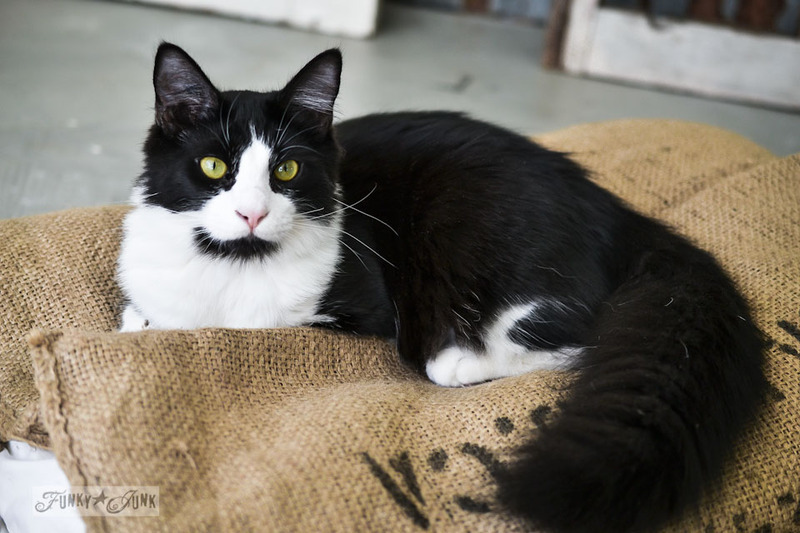 Hi Donna, Love what you’ve done with the burlap bags! 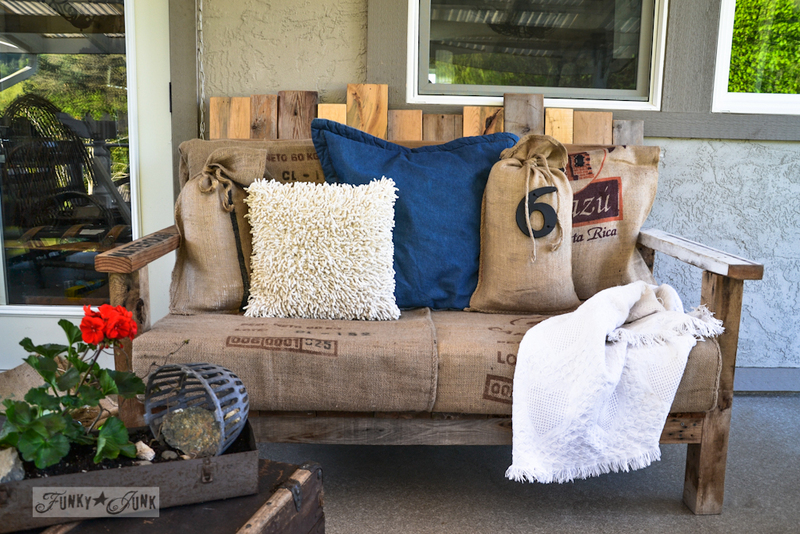 Love your outdoor sofa with the burlap bag that says “Oakland, CA”. I’m from Oakland so it always catches my eye. You’ve got a great blog! Donna, about sewing machine suggestions…unless you want to buy a very expensive machine, most new machines are made with plastic parts, and I don’t mean the outside casing, but the inner, moving parts. My sewing machine guy does not think much of these types of machines, even those coming from a reputable manufacturer like Singer. A good way to get a sturdy, older machine with metal parts is to find a local sewing machine repair person. They sometimes will sell machines that they have refurbished. Machines with metal parts can last for many years and can be kept in good working order by a good repair person. My machine was given to me over 20 years ago and was an older machine then. It still works like a charm with a little oiling and an occasional tune-up. Also, if you are a novice seamstress and intend to stay with simple sewing, you know, forward, backward, maybe a little zig-zag, or a button hole, then avoid machines that do a lot of fancy stuff, or are computerized. There is just more that can go wrong with that kind of machine. Find a simple little machine, and I think you will be very satisfied with that. My repair man (he also repairs my vacuum which is why I know him as I have much more trouble with my vacuum than with my sewing machine), highly recommends a Singer Featherweight quilting machine. He says they are much desired and in high demand and he sells them almost as soon as he gets one in. They are very light, very portable, highly functional, and beautifully vintage. This seems a little pricy. Again, I would check with your local repair man. I think they are out there, and do not have to cost $400.00. I got to see one in person at the repair shop, and it was lovely. If I didn’t already have a couple of machines, I would be looking for one of these for sure. Those are just my suggestions. Others may disagree and feel that an expensive new machine is the way to go. Follow your instincts! Did you get these free or did you buy them…if so, how much did you pay? I love the pillows and the ease of no sewing diy. But it is your cats that catch my eye. Sky and Lake are clearly the cats meow!!!! 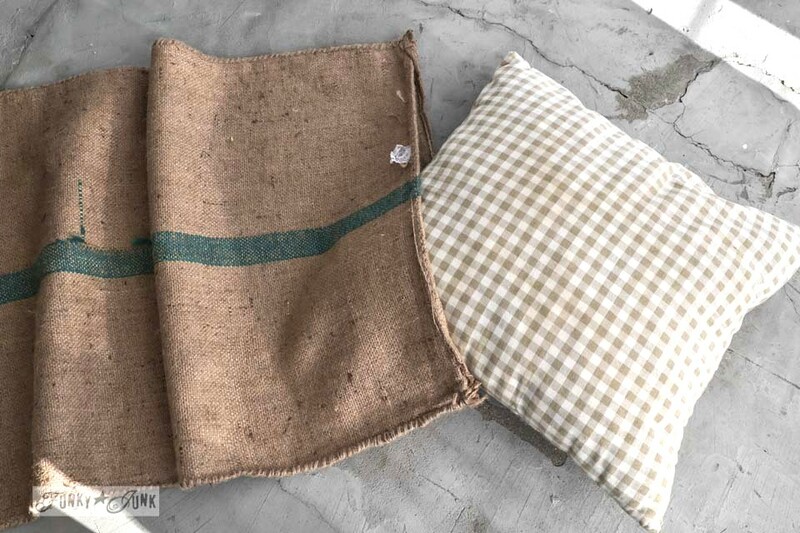 Now this is my kinda pillow…very cool..
Any tips for softening really scratchy burlap? I was given some sacks that I’m just itching (literally, they’re very itchy!) to use, but they are ROUGH. They feel more like straw than burlap. Jute is weird stuff. There is good jute and bad jute, so it’s a matter of hunting. You may get a better quality from a fabric store. But I’m kinda thinking a thick linen might resemble a grain sack the most, while adding the quality you’re after. Or even a painter’s drop cloth… fabulously hard wearing and soft! And even super easy to stencil on. 🙂 I’d go that route if you are unsure of the jute for chairs. thank you, thank you, and thank you! I wanted outdoors pillows that if they got wet while outside, I would not be to upset. Thanks to you, I know how to have beautiful pillows outside, without spending a lot. I really love the look of the burlap as well. Now I need to see if I can find some for myself. Thanks so much for this post.